Odoo celebrates freedom. Freedom for the designer to go further and freedom for the user to customize everything according to their needs. Ready to create your own theme? Great. Here are some things you should know before you begin. 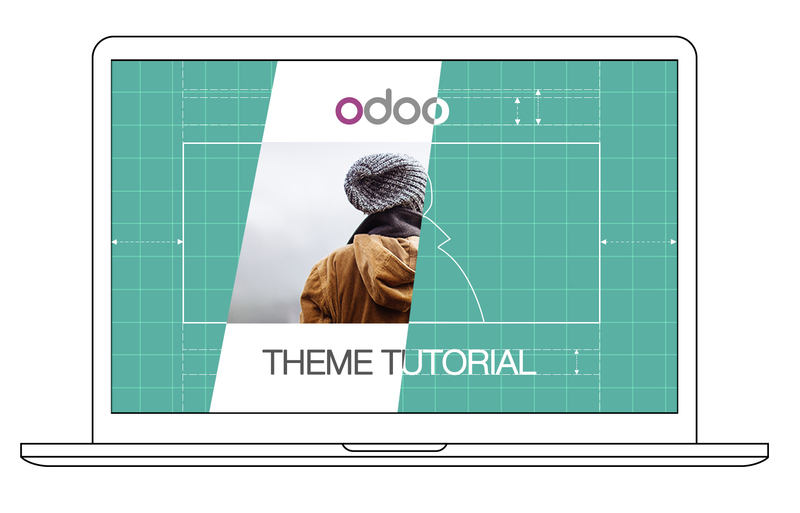 This tutorial is a guide to creating an Odoo theme. If you are a web designer using Odoo for the first time, you are in the right place. This introduction will outline the basics of Odoo theme creation. Odoo’s team has created a framework that’s powerful and easy to use. There’s no need to know special syntaxes to use this set of tools. If you always think and work in the same way, you’ll probably get the same results. If you want something completely new, then try something different. Where is my header.php file? This is usually the first question from a web designer used to working with Wordpress or Joomla and coming to Odoo for the first time. Indeed, when using common CMSs, you have to code several files (like header.php, page.php, post.php, etc.) in order to create a basic structure for your website. 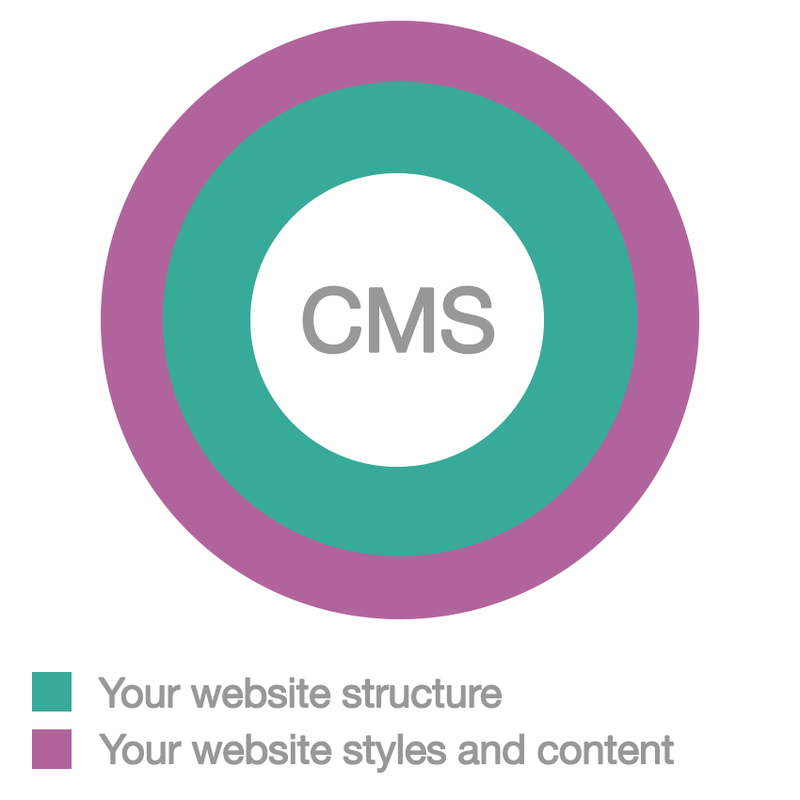 With those systems, this base structure acts as a design foundation that you have to update over time to ensure compatibility within your CMS. So, even after you have spent hours coding the files, you have not even started on the design yet. This does not apply to creating Odoo themes. 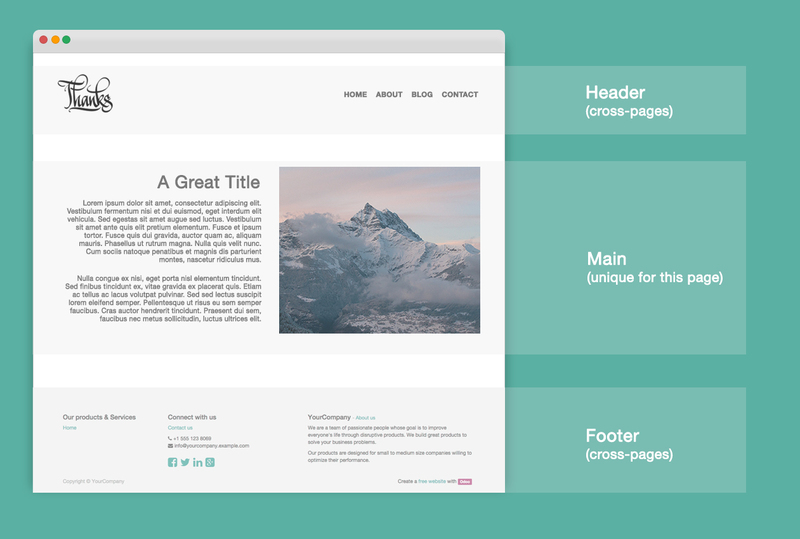 We think that theme design should be simple (and powerful). When we created our Website Builder, we decided to start from scratch instead of relying on what already existed. This approach gave us the freedom to focus on the things that are really important for designers: styles, content and the logic behind them. No more struggling with technical stuff. 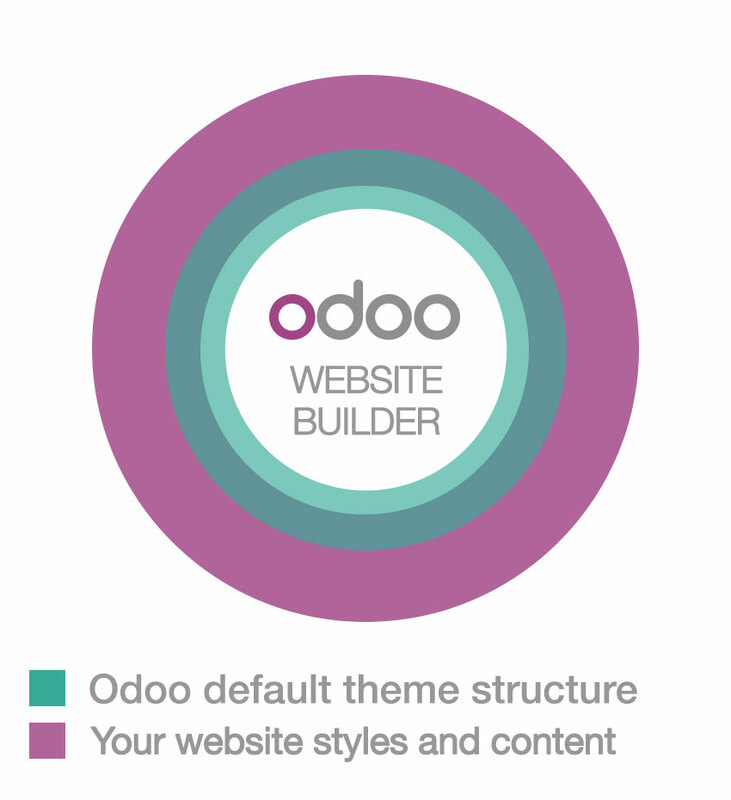 Odoo comes with a default theme structure. It is a very basic “theme” that provides minimal structure and layout. When you create a new theme, you are actually extending this. Indeed it’s always enabled in your setup and it acts exactly like the CMS’s base structure we mentioned above, except that you don’t have to create or maintain it. It will upgrade automatically within your Odoo installation and, since it is included in the Website Builder module, everything is smoothly integrated by default. As a result, you are totally free to focus on design while this structure does the job of providing integrations and functionality. An Odoo theme is not a folder containing HTML or PHP files, it’s a modular framework written in XML. Never worked with XML files before? Don’t worry, after following the tutorial, you’ll be able to create your first theme with only basic knowledge of HTML. Using classical web design workflows, you usually code the layout of the entire page. The result of this is a “static” web page. You can update the content, of course, but your client will need you to work on making even basic changes. Creating themes for Odoo is a total change of perspective. 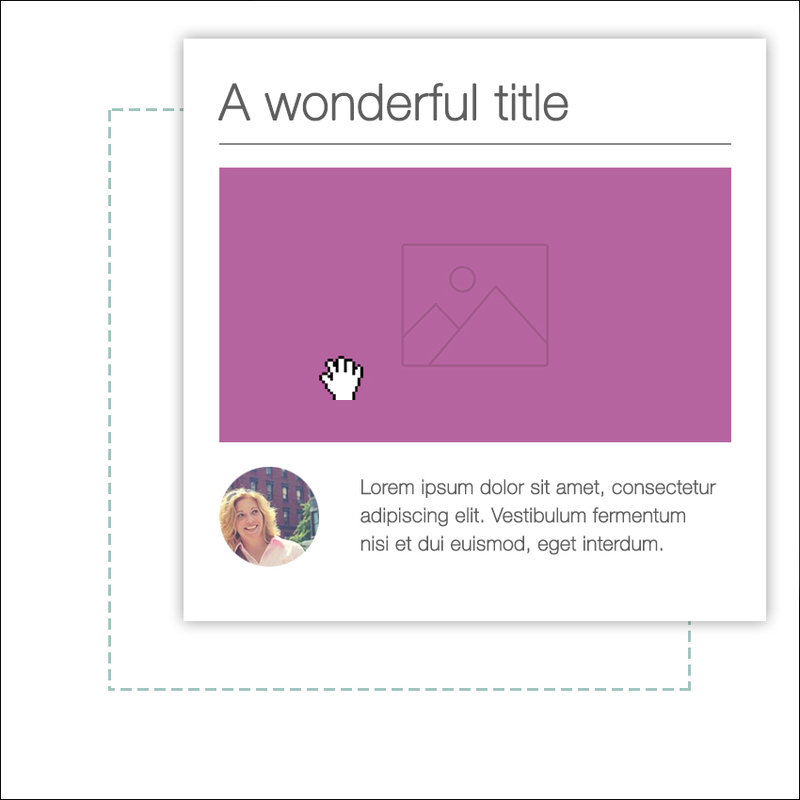 Instead of defining the complete layout for a page, you can create blocks (snippets) at let the user choose where to “drag&drop” them, creating the page layout on their own. We call this modular design. Imagine an Odoo theme as a “list” of elements and options that you have to create and style. As a designer, your goal is to style these elements in order to achieve a wonderful result, regardless of where the end user chooses to place them. A piece of HTML code. The user will drag&drop, modify and combine them using our built-in Website Builder interface. You can define sets of options and styles for each snippet. The user will choose from them according to their needs. These are normal web pages, except that they will be editable by the final user and that you can define an empty area that the user can “fill” by dragging snippets into it. Styles are defined using standard CSS files (or Less/Sass). You can define a style as default or optional. The default styles are always active in your theme, the optional styles can be enabled or disabled by the user. Thanks to Odoo’s modularity, everything can be personalized even more. This means there are endless possibilities for your creativity. Adding functionalities is easy and it’s simple to provide the end user with customizable options. Any Odoo XML file starts with encoding specifications. After that, you have to write your code inside a <data> tag, placed into an </openerp> tag. Almost every element and option that you create has to be placed inside a <template> tag, like in this example. don't misunderstand what template means. A template tag only defines a piece of html code or options - but it does not necessarily coincide with a visual arrangement of elements. The previous code defines a title, but it will not be displayed anywhere because that template is not associated with any part of the Odoo default structure. In order to do that you can use xpath, qWeb or a combination of both. Keep reading the tutorial to learn to how properly extend it with your own code. Keep reading the tutorial to learn to how properly extend it with your own code. Since XML files are only loaded when you install the theme, you will have to force reloading every time you make changes on an xml file. To do that, click on the Upgrade button in the module’s page. Odoo’s themes are packaged like modules. Even if you are designing a very simple website for your company or client, you need to package the theme like an Odoo module. Create a folder and name it like this: theme_ followed by your theme's name. Create an empty document and save it to your folder as __openerp__.py. This will contain the configuration info for your theme. Create another empty file and name it __init__.py. It's a mandatory system file. Create and leave it blank. Create them in the main folder. In views you'll place your xml files that define your snippets, your pages and your options. 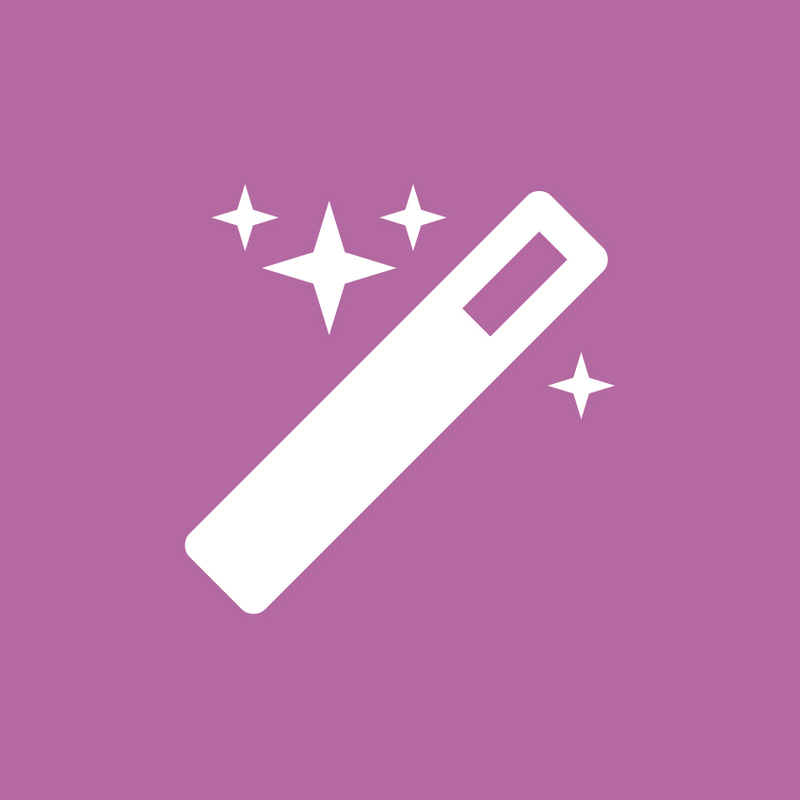 static folder is the right place for your style , images and custom js code. Use two underscore characters at the beginning and two at the end of openerp and init file names. Replace the first four property’s values with anything you like. These values will be used to identify your new theme in Odoo’s backend. The data property will contain the xml files list. Right now it’s empty, but we will add any new files created. depends specifies the modules needed by our theme to work properly. For our tutorial theme, we only need website and website_less. If you need blogging or eCommerce features as well, you have to add those modules too. 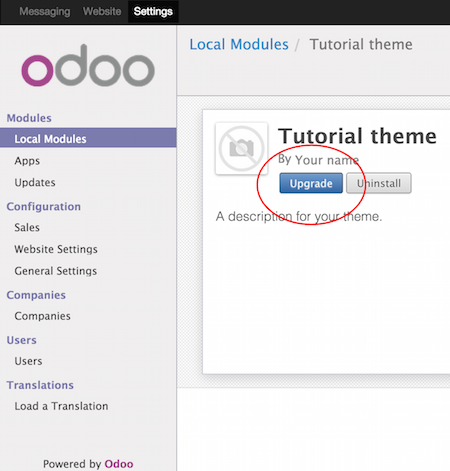 To install your theme, you just place your theme folder inside addons in your Odoo installation. After that, navigate to the Settings page, look for your theme and click on the install button. An Odoo page is the visual result of a combination of 2 kind of elements, cross-pages and unique. 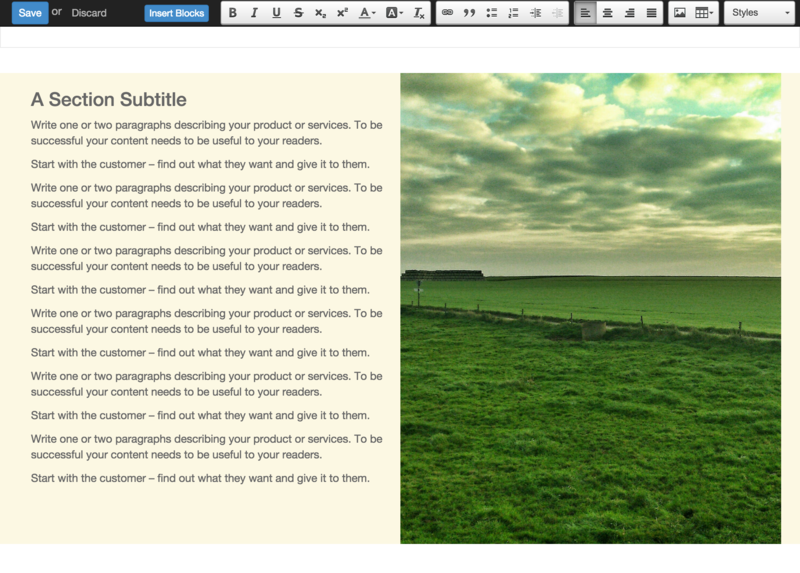 By default, Odoo provides you with a Header and a Footer (cross-pages) and a unique main element that contains the content that makes your page unique. Cross-pages elements will be the same on every page. Unique elements are related to a specific page only. 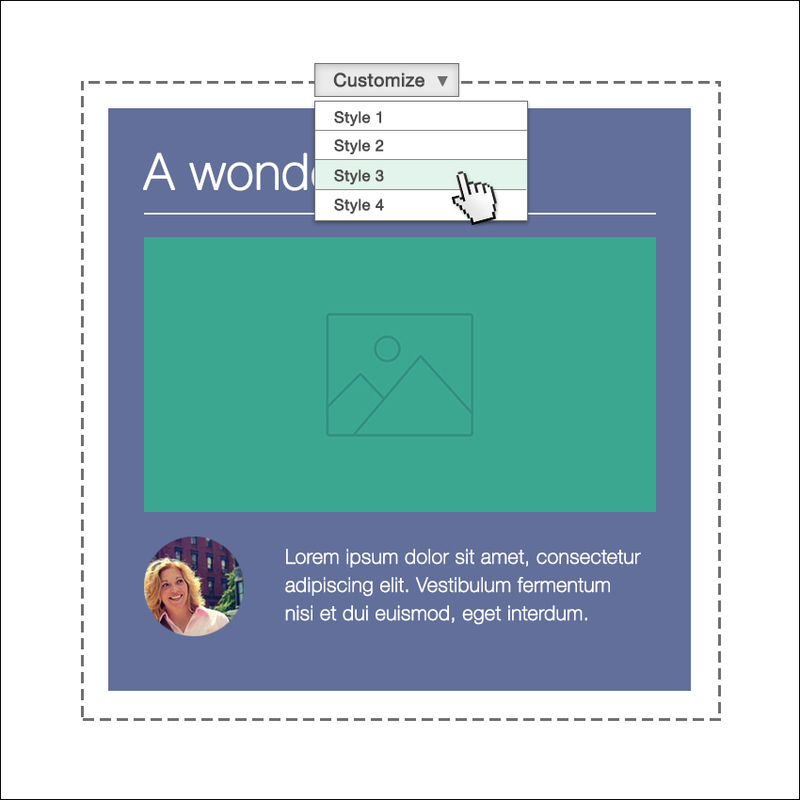 To inspect the default layout, simply create a new page using the Website Builder. Click on Content ‣ New Page and add a page name. Inspect the page using your browser. By default, Odoo header contains a responsive navigation menu and the company’s logo. You can easily add new elements or style the existing one. To do so, create a layout.xml file in your views folder and add the default Odoo xml markup. Create a new template into the <data> tag, copy-pasting the following code. The first xpath will add the id my_header to the header. It’s the best option if you want to target css rules to that element and avoid these affecting other content on the page. Be careful replacing default elements attributes. 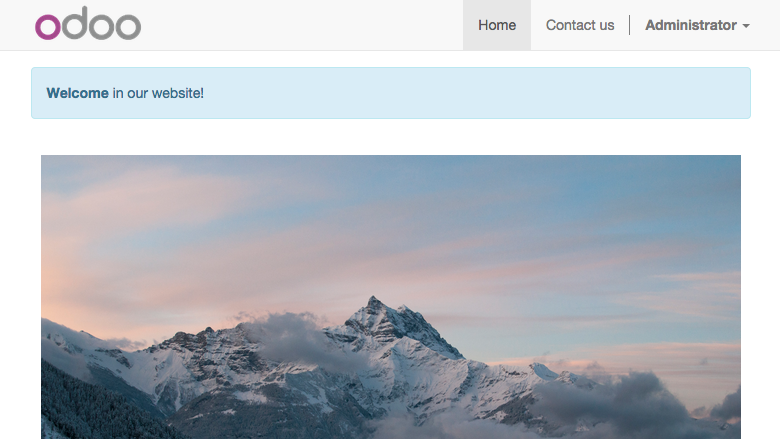 As your theme will extend the default one, your changes will take priority in any future Odoo’s update. The second xpath will add a welcome message just after the navigation menu. Great! We successfully added an id to the header and an element after the navigation menu. These changes will be applied to each page of the website. Imagine that we want to create a specific layout for a Services page. For this page, we need to add a list of services to the top and give the client the possibility of setting the rest of the page’s layout using snippets. Inside your views folder, create a pages.xml file and add the default Odoo markup. Inside <data> create a <template> tag, set the page attribute to True and add your code into it. We successfully created a new page layout, but we haven't told the system how to use it. To do that, we can use QWeb. Wrap the html code into a <t> tag, like in this example. 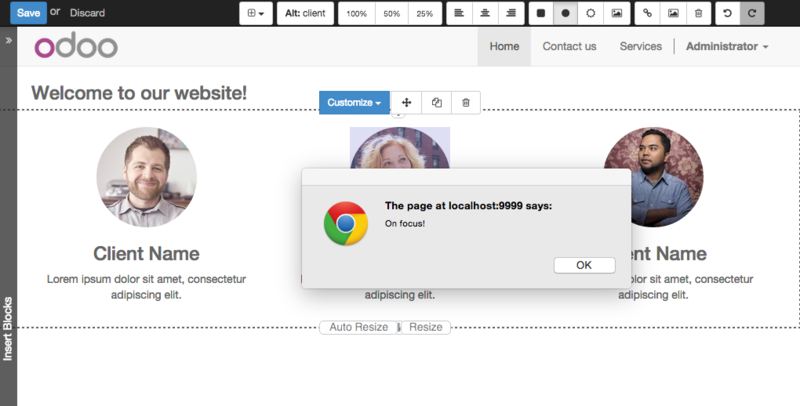 Using <t t-call="website.layout"> we will extend the Odoo default page layout with our code. As you can see, we wrapped our code into two <div>, one with ID wrap and the other one with class container. This is to provide a minimal layout. The next step is to add an empty area that the user can fill with snippets. To achieve this, just create a div with oe_structure class just before closing the div#wrap element. 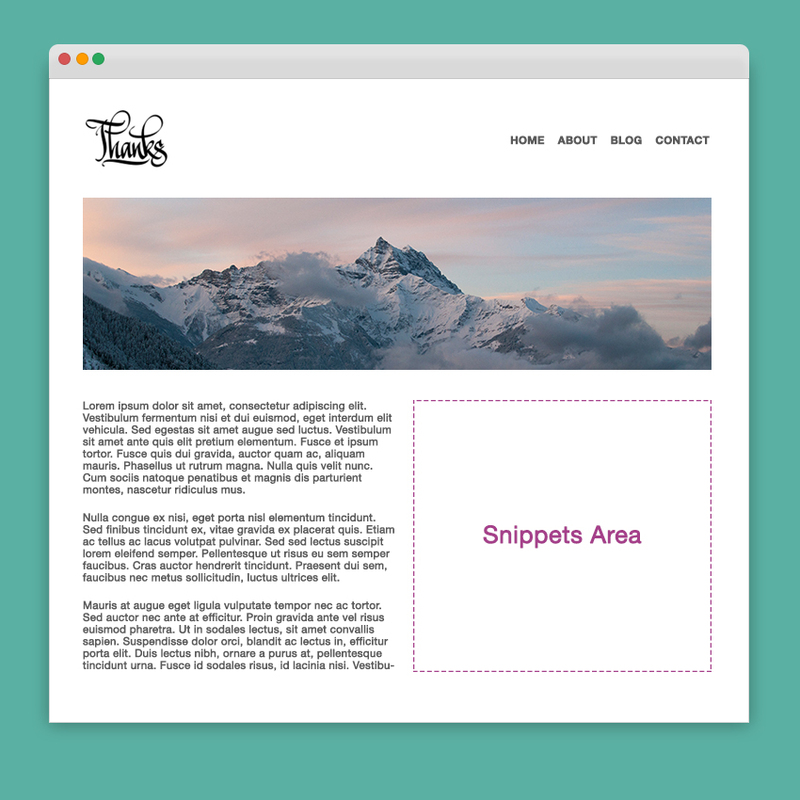 You can create as many snippet areas as you like and place them anywhere in your pages. Great, our Services page is ready and you’ll be able to access it by navigating to /yourwebsite/page/services. You will notice that it's possible to drag/drop snippets underneath the Our Services list. Now let's go back to our pages.xml and, after our page template, copy/paste the following code. This code will add a link to the main menu. The sequence attribute defines the link’s position in the top menu. In our example, we set the value to 99 in order to place it last. I you want to place it in a particular position, you have to replace the value according to your needs. As you can see inspecting the data.xml file in the website module, the Home link is set to 10 and the Contact us one is set to 60 by default. If, for example, you want to place your link in the middle, you can set your link’s sequence value to 40. Odoo includes Bootstrap by default. 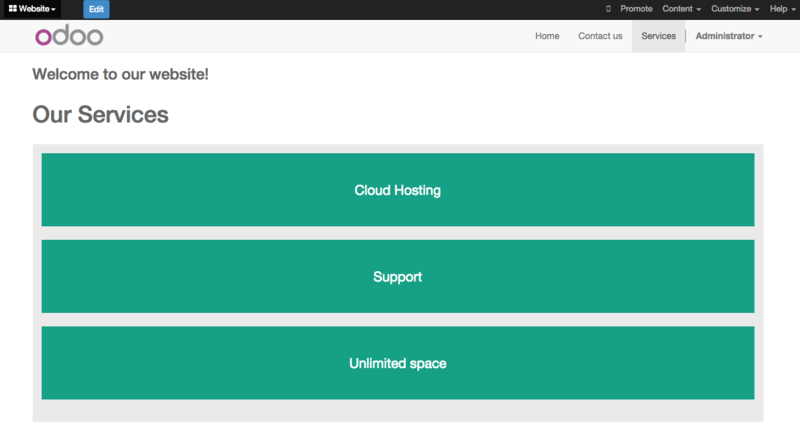 This means that you can take advantage of all Bootstrap styles and layout functionalities out of the box. Of course Bootstrap is not enough if you want to provide a unique design. The following steps will guide you through how to add custom styles to your theme. The final result won't be pretty, but will provide you with enough information to build upon on your own. Let’s start by creating an empty file called style.less and place it in a folder called less in your static folder. The following rules will style our Services page. Copy and paste it, then save the file. Our file is ready but it is not included in our theme yet. Let’s navigate to the view folder and create an XML file called assets.xml. Add the default Odoo xml markup and copy/paste the following code. Remember to replace theme folder with your theme’s main folder name. We just created a template specifying our less file. As you can see, our template has a special attribute called inherit_id. This attribute tells Odoo that our template is referring to another one in order to operate. In this case, we are referring to assets_frontend template, located in the website module. assets_frontend specifies the list of assets loaded by the website builder and our goal is to add our less file to this list. This can be achieved using xpath with the attributes expr="link[last()]" and position="after", which means "take my style file and place it after the last link in the list of the assets". Placing it after the last one, we ensure that our file will be loaded at the end and take priority. Finally add assets.xml in your __openerp__.py file. Our less file is now included in our theme, it will be automatically compiled, minified and combined with all Odoo’s assets. Since snippets are how users design and layout pages, they are the most important element of your design. Let’s create a snippet for our Service page. The snippet will display three testimonials and it will be editable by the end user using the Website Builder UI. Navigate to the view folder and create an XML file called snippets.xml. Add the default Odoo xml markup and copy/paste the following code. The template contains the HTML markup that will be displayed by the snippet. As you can see, we used Bootstrap default classes for our three columns. It’s not just about layout, these classes will be triggered by the Website Builder to make them resizable by the user. The previous code will create the snippet’s content, but we still need to place it into the editor bar, so the user will be able to drag&drop it into the page. Copy/paste this template in your snippets.xml file. Using xpath, we are targeting a particular element with id snippet_structure. This means that the snippet will appear in the Structure tab. If you want to change the destination tab, you have just to replace the id value in the xpath expression. The <t> tag will call our snippet's template and will assign a thumbnail placed in the img folder. You can now drag your snippet from the snippet bar, drop it in your page and see the result. 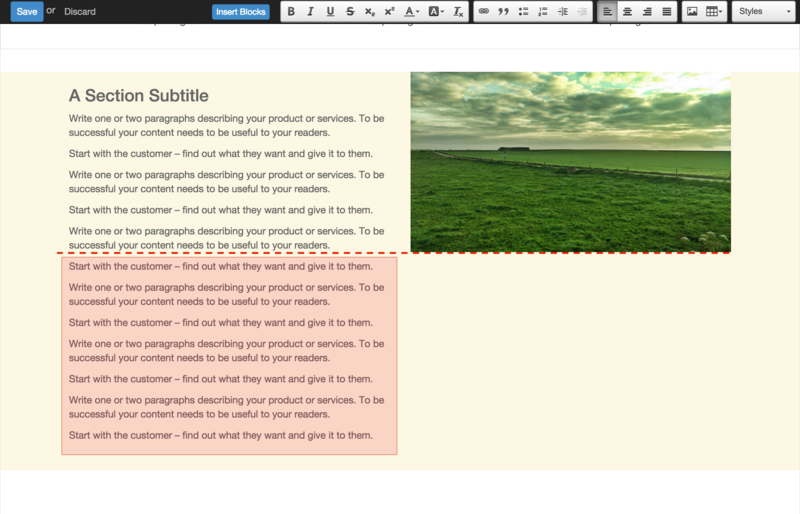 Options allow publishers to edit a snippet’s appearance using the Website Builder’s UI. 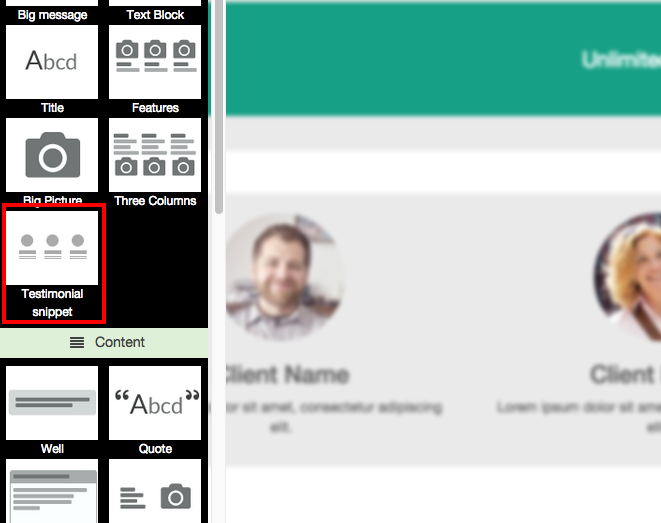 Using Website Builder functionalities, you can create snippet options easily and automatically add them to the UI. Options are wrapped in groups. Groups can have properties that define how the included options will interact with the user interface. Bind all the options included into the group to a particular element. data-js=" custom method name "
Defines the list of elements where the snippet can be dropped into. Defines the list of elements that the snippet can be dropped beside. Options apply standard CSS classes to the snippet. Depending on the method that you choose, the UI will behave differently. More data-select_class in the same group defines a list of classes that the user can choose to apply. Only one option can be enabled at a time. The data-toggle_class is used to apply one or more CSS classes from the list to a snippet. Multiple selections can be applied at once. Let's demonstrate how default options work with a basic example. The previous template will inherit the default snippet_options template adding our options after the background options (xpath expr attribute). To place your options in a particular order, inspect the snippet_options template from the website module and add your options before/after the desired position. As you can see, we wrapped all our options inside a DIV tag that will group our options and that will target them to the right selector (data-selector=".snippet_testimonial"). To define our options we applied data-select_class attributes to the li elements. When the user selects an option, the class contained in the attribute will automatically be applied to the element. Since select_class method avoids multiple selections, the last "empty" option will reset the snippet to default. Add options.xml to __openerp__.py and update your theme. Dropping our snippet onto the page, you will notice that our new options are automatically added to the customize menu. Inspecting the page, you will also notice that the class will be applied to the element when selecting an option. // These lines will add a default style for our snippet. Now let's create our custom rules for the options. Great! We successfully created options for our snippet. Any time the publisher clicks on an option, the system will add the class specified in the data-select_class attribute. By replacing data-select_class with data-toggle_class you will be able to select more classes at the same time. data-select_class and data-toggle_class are great if you need to perform simple class change operations. But what if your snippet’s customization needs something more? As we said before, data-js propriety can be assigned to an options group in order to define a custom method. Let’s create one for our testimonials snippet by adding a data-js attribute to the option’s group div that we created earlier. Done. From now on, the Website Builder will look for a snippet_testimonial_options method each time the publisher enters in edit mode. As you will notice, we used a method called on_focus to trigger our function. The Website Builder provides several events you can use to trigger your custom functions. on_focus Fires each time the snippet is selected by the user or when the snippet is drag-dropped into the page. on_blur This event occurs when a snippet loses focus. on_clone Fires just after a snippet is duplicated. A new js variable is created ($clone) containing the cloned element. on_remove It occurs just before that the snippet is removed. drop_and_build_snippet Fires just after that the snippet is drag and dropped into a drop zone. When this event is triggered, the content is already inserted in the page. clean_for_save It trigger before the publisher save the page. Basically all the elements in a page can be edited by the publisher. Besides that, some element types and css classes will trigger special Website Builder functionalities when edited. Any section element can be edited like a block of content. The publisher can move or duplicate it. It’s also possible to set a background image or color. Section is the standard main container of any snippet. Any medium bootstrap columns directly descending from a .row element, will be resizable by the publisher. This attribute will prevent editing to the element and all its children. Apply it to an element inside a contenteditable="False" element in order to create an exception and make the element and its children editable. In Edit Mode, any link can be edited and styled. Using the “Link Modal” it’s also possible to replace it with a button. Pictogram elements. Editing this element will open the Pictogram library to replace the icon. It’s also possible to transform the elements using CSS. Once clicked, the Image Library will open and you can replace images. Transformation is also possible for this kind of element. This html structure will create an <iframe> element editable by the publisher. Modern search engine algorithms increasingly focus on content, which means there is less focus on keyword saturation and more focus on whether or not the content is actually relevant to the keywords. As content is so important for SEO, you should concentrate on giving publishers the tools to easily insert it. It is important that your snippets are “content-responsive”, meaning that they should fit the publisher’s content regardless of size. Let’s have a look to this example of a classic two column snippet, implemented in two different ways. Using fixed image, the publisher will be forced to limit the text in order to follow the layout. Using background images that fit the column height, the publisher will be free to add the content regardless of the image’s height. Basically, page segmentation means that a page is divided into several separate parts and these parts are treated as separate entries by search engines. When you design pages or snippets, you should be sure to use the right tags in order to facilitate search engine indexing. Specifies an independent block of content. Within it should be a piece of self-contained content that should make sense on its own. You can nest <article> elements within one another. In this case, it’s implied that the nested elements are related to the outer <article> element. Indicates the header section of a self-contained block of content (an <article>). Is the snippet default tag and it specifies a subsection of a block of content. It can be used to split <article> content into several parts. It’s advisable to use a heading element (<h1> – <h6>) to define the section’s topic. You should use appropriate, relevant keywords and synonyms for those keywords. You can define them for each page using the built-in “Promote” function found in the bar at the top. Define them using the “Promote” function. Keep your page titles short and include the main keyword phrase for the page. Good titles evoke an emotional response, ask a question or promise something. Descriptions, while not important to search engine rankings, are extremely important in gaining user click-through. These are an opportunity to advertise content and to let people searching know exactly whether the given page contains the information they're looking for. It is important that titles and descriptions on each page are unique.